The White Moustache’s Homa Dashtaki told me that making yogurt is magical to her. Magic. And I agree, because you are the catalyst in transformation—with heat and a bit of culture, milk becomes creamy and tangy and thick and sustaining. And simply: If you’re looking to make more of your food from scratch, yogurt is a very easy and rewarding place to begin. best batch of yogurt yet! boil milk, let cool to baby-bath warm, stir in yogurt, keep cozy 8 hours. refrigerate after that. It’s less expensive. A gallon of milk will make just slightly less than a gallon of yogurt for about half of what you'd buy the same amount of yogurt for. If you strain your yogurt, you'll get a bit less yogurt—but you’ll also get a whole lot of electric-looking white-yellow whey, which you can either drink au natural, like I do, or use in any number of other ways (including adding it to smoothies, cocktails, breads, and brines). Two products for the price of one! You control everything, from the milk itself to how tangy or mild and thick or loose your finished product is. You don’t need any special equipment—no yogurt machine or thermometer or even recipe—to make it. 1. Heat the milk, cool the milk. For sake of explanation, let’s say you’re using half a gallon of whole milk. (This is easily halved or tripled or doctored to whatever amount of yogurt you want to make.) Why whole? The more fat in your milk, the creamier your yogurt will be, and the more it will set up. Homa, of White Moustache, advises that using organic milk, which typically has to be ultra-pasteurized, may not set up well. Others (including myself) haven’t had a problem with it. Up to you! If you can get your hands on raw milk (lucky dog! ), by all means, use it. Pour the half-gallon of milk into a heavy pot set over medium heat and slowly bring the milk up to a boil. Don’t be shy here; it needs to be a full rolling boil. Doing this kills any bacteria that could contend with the bacteria in your yogurt starter, but since most milk sold commercially is already pasteurized, you likely don’t have to worry about any bacteria. But heating the milk does change the structure of the milk protein casein, which is what will give you a creamy yogurt. When the milk comes to a boil, remove the pot from the heat and let it cool. You’re looking for it to be baby-bath warm, and you’ll know you’ve hit the right temp when you can put your pinky finger in the warm milk and leave it there comfortably for 3 seconds. More: Homa's tips and best practices for making yogurt at home. That’s your yogurt sample, either from your previous batch of yogurt or from a store-bought yogurt. (Homa recommends Fage.) Add two tablespoons directly to your pot of milk, stir gently (or not at all, as Alana Chernila recommends as a way of preventing grainy-textured yogurt), then put the lid on your pot. This is also a good time to add a splash of vanilla extract for a vanilla-flavored yogurt. Alana has also written about letting a vanilla bean steep in this warm milk while it sits. Put your yogurt in a warm place for between 4 hours and 12 hours (overnight). The longer you let it sit out, the tangier it will be; I like a moderate 8-hour rest. The yogurt needs to stay really warm during this rest; otherwise, the bacteria you added via the yogurt culture won’t multiply and your yogurt won’t set up! Folks like to do this in a couple of ways: Some will place the pot in the oven with the oven light turned on; others line a cooler with a towel and set the pot inside. I have neither an oven with a working light nor a cooler, so my preferred tactic is to wrap my pot in a blanket (spreading the blanket on my kitchen table, setting the pot in the middle, and bundling the blanket up around the pot). Then I put the bundle on top of my refrigerator, which tends to be a warm, out-of-the-way spot in my kitchen. While your yogurt rests, get the vessels you’re planning on storing the yogurt in very clean by washing in hot, soapy water or running through the dishwasher. After your yogurt has sat for your desired number of hours, it will have set up: Unbundle the pot, remove the lid, and take a peek. It should look firm and gelled, and, depending on the milk you used, may have a layer of cream on top (!). Scoop out a spoonful; whey will rush into the divot your spoon makes. If you want your yogurt at this consistency (fairly loose but very creamy), you’re all done! Portion the yogurt into the clean vessels and refrigerate for at least an hour before serving. 5. Strain for a thicker yogurt. Line a colander with a very, very clean dishtowel, and set that colander inside a large bowl or pot. Pour the yogurt into the lined colander, cover with plastic wrap (or a pot lid) and set the whole thing in the refrigerator. Even a couple of hours will make a big difference, but the longer you leave it straining, the thicker the yogurt will be (and the more whey you’ll have—more than 2 cups’ worth). Tell us about your own yogurt-making experiences and aspirations and tips and tricks in the comments. I have been making nonfat yogurt for at least 20 years, usining nonfat dried milk. tangy and easy...6 hours perfect..no milk fat or sugar!!! Tried this and could not get the yogurt to set. I guess my oven light produces less heat than other people's or something. That method wasn't close to warm enough for me. Going to try it again with the "keep warm" function. If that doesn't work, I'll explore some of the great-sounding recipes here in the comments. try turning on to 150-200. then turn off when you put the yogurt in. do not open..until time is up..put a sticky on the door...to remind you not to turn on the oven or open the door! I heat the milk to a boil, shut it off and let it cool down to 110 degrees. I then pour it into a clean mixing bowl and whisk in the starter. Then it goes into warmed Corning Ware casserole dishes with the lids on. I place the casseroles on a heating pad turned on warm, throw several old bath towels over the set up and let 'er rip for however long I want. I sometimes leave it go 12 to 24 hours. Then I set the casseroles in the fridge until it is cold, whisk it and pour the yogurt into containers for later consumption. Works great. Agree with the author about not using powdered milk, mostly because it tastes awful. I prefer yogurt for probiotics and greek yogurt full of probiotics. I have blog on Probiotics and yogurt, you can read all the information. I prefer Greek Yogurt, it's a good diet food as well. I've started making my yogurt for the past 6 months and recently have had a string of batches that taste carbonated. Not sure what is causing it. I have noticed it's usually when I've used a culture from previous batch, though the batch was not fizzy. How do I fix this? Don't want to have to keep buying new cultures! I have found if you use starter from a previous batch it doesn't work as well. By the 3rd time around you get really scuzzy results. I always use fresh, plain store yogurt. Works much better. I just made a batch of yogurt using Ultra Pasteurized Half and Half milk, it came out indescribably thick and delicious. Fermented for 10 hours; it was medium tart. If you make yogurt, you have to try a batch with half and half !! My latest method was gleaned from other websites. I slowly heat a half gallon of whole milk in a stainless pan (rinsed with cold water before pouring in the milk) to 180, checking with my instant read thermometer. Cool to 105-110 (takes about 45 minutes; I set my timer). Then I whisk 1/2 cup of room-temperature yogurt reserved from my previous batch with 1/2 cup of the warm milk and gently stir into the pan of milk. Using a canning funnel, I ladle the milk into 2 sterilized Ball jars, plus 1 sterilized 1/2 pint jar (this is part of my starter for the next batch), and screw on plastic lids. Last of all, I put all 3 jars in a very small cooler and add the hottest my tap water can get to the entire cooler until the water reaches halfway up the quart jars. (I do have to set the half pint jar on top of a small upside-down bowl so it doesn't float away!) If I do this after dinner, the yogurt will be well set and taste delicious by breakfast the next day. It's been a foolproof method for me, and I've tried many methods over the last 45 years! Using sterile utensils is to avoid cross-contamination by other molds that might be hanging around your kitchen (cheeses, fruit, vinegars, etc.) that could interfere with proper yog'ing. Heating to 180 degrees is not to further sterilize pasteurized milk, it is to make the proteins coagulate better. You need to heat to 180 even if you're using reconstituted powdered milk. "since most milk sold commercially is already pasteurized, you likely don’t have to worry about any bacteria...get the vessels you’re planning on storing the yogurt in very clean by washing in hot, soapy water or running through the dishwasher...Line a colander with a very, very clean dishtowel..."
All this emphasis on cleanliness is great from a food safety standpoint, but then you illustrate the article with a picture of someone's finger in the starter. That is really not a good sanitary practice. The BEST thing to do with whey? ! ! Use it for starter. It has all the bacteria your yogurt has. Works like a charm. Over 160 degrees for more than a few minutes (doesn't need to boil, but does need to stay above temperature for more than an instant). Cool to at least 110. Add starter, and put in Instant Pot or "proof" setting of oven at 90 degrees. It should be okay. Just turn the machine on and let it go for another 12 hours. Because it has been so warm here for the past few weeks, I have just left the milk with the culture on the kitchen counter and it has progressed just fine. You can tell at the end of the process - if the milk is thick, it has converted. Did you heat it to 180° and then cool it to 115° before adding your yogurt culture? That is always necessary for the milk to "convert" the beneficial bacteria. I have posted several times in the past. I have an entire treatise about yogurt on my blog. NEVER BOIL THE MILK! Bring the temp up to 180-200 degrees (186 is optimal) then cool to 115°F. and then add the powdered cultures or the culture from a previous batch. There are certain ways to manipulate the yogurt. Less butterfat means IT WILL HAVE MOR OF A "TANGY" FLAVOR. More butterfat with produce a thicker yogurt and LESS TANG! 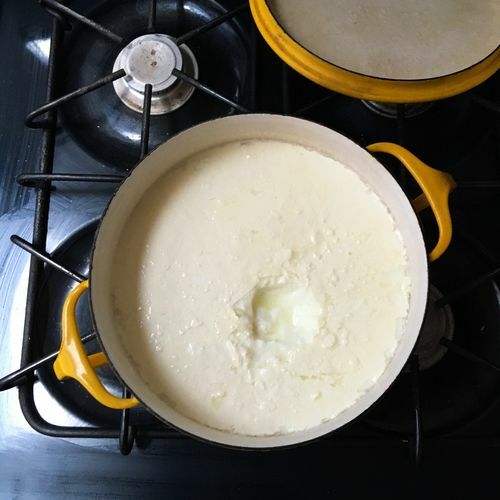 You can use half and half and even heavy cream, which gives a product that when strained - produces very little whey - that is a good substitute for clotted cream, without all the work. I make kefir, does not require heating. I make sour cream and creme fraiche and cream cheese with CULTURES from the New England Cheesemaking company. I use probe thermometers that are sterilized and you need the temperature deep in the liquid. An infrared thermometer reads ONLY THE SURFACE temp and is not accurate. Totally agree Andie! And, a quick way to cool down the milk is to set the pot in a sink of cool water - again watching the thermometer till it reaches 115. I make yogurt every week and it always turns our perfect with Andie's method - I have used all milk, part half and half and even part whole cream - it's all good. oops! For my last note - use the yogurt in place of sour cream to make sour cream cake. Sorry. I love my mother in laws sour cream cake. I use my yogurt instead of cream cheese - there is NO difference. One helper: use whey as starter for next batch. It has the same bacteria as the yogurt. Another helper, strain yogurt for up to 20hours..what you get is yogurt CREAM CHEESE! If you have a good thermometer gun (this prevents introducing non-culture bacteria into the mix), you can measure and document the differences in how your yogurt is prepared and establish an optimal recipe for the kind of yogurt that you find most appealing. The documentation is important as in ever kind of research. Make it a sort of good tasting introduction to real science for your children.